Subaru will unveil three important new cars in Geneva, the world premiere of the VIZIV Concept, the 2013 Outback Diesel Lineartronic and all-new 2014 Forester. Subaru is one of the most progressive automakers on the planet and they are showing the world what the future will look like. Subaru has announced that it will exhibit the Subaru VIZIV Concept at the upcoming 83rd Geneva International Motor Show. Fuji Heavy Industries (FHI) who is the parent company of Subaru will also introduce the world premiere of the new Subaru Outback Diesel with Lineartronic, and the all-new 2014 Subaru Forester will make its European debut. The Geneva Auto Show is the place to be in Europe for those interested in the latest new cars and opens its doors to the public on March 7th, 2013. Like most auto manufacturers, Subaru has released what cars they will be exhibiting before the event to get both media and public attention. Subaru is bringing three of their newest cars to give the world an idea of what to expect from the Japanese automaker in the future, and what they are doing now. 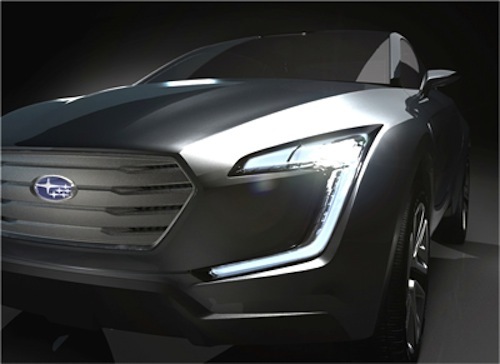 The brands future news is the new Subaru VIZIV Concept. We can get a good idea of where a brand is heading in the future by looking at what concept cars they unveil at the Geneva Auto Salon. This is Europe’s premiere auto show and a chance for automakers to shine. The Subaru VIZIV Concept is a “future-generation” crossover concept that shows the brand will keep its focus on what made them so successful. Subaru is known for their rugged go-anywhere crossover vehicles. What will set the new VIZIV Concept apart is its innovation and new technologies. Subaru says the VIZIV Concept “represents a direction of new designs and new technologies enhancing the Subaru brand into the future.” While we don’t know how far into the future it will be, we do know FHI has a track record of bringing new vehicles to production quickly. It is a future-generation crossover concept "VIZIV" model name is a coined word inspired by the phrase "Vision for Innovation". It expresses a future vision for innovation, and a concept car suggesting the brand's direction. Subaru announced last month that the 2013 Outback 2.0 Diesel model would be teamed for the first time with the Lineartronic (CVT) automatic transmission. The diesel coupled to the new CVT transmission will feature Adaptive Control and manual shifting. This is the first automatic transmission offered to its diesel range and will be offered around the globe in the 2013 Outback. To the angst of buyers here in the U.S., we will not be seeing a U.S. Subaru diesel variant anytime soon, but the diesel s a popular seller in Australia in both the Outback and Forester. Nick Senior, Managing Director, Subaru Australia, said: “Diesel manual Outback now represents around 20 per cent of the model’s sales, so we’re anticipating significant demand for the auto.” The new 2013 Outback diesel automatic will be available in entry-level 2.0D, which adds factory-fitted satellite navigation. 2.0D Premium trims add a variety of features including electric sunroof, leather trim, eight-way power driver’s seat with memory function and electroluminescent gauges with color information display. The all-new 2014 Subaru Forester has been making its way around the globe and will be displayed in Geneva along with technical exhibits. The all-new fourth generation Forester has been completely redesigned and features a newly designed exterior, roomier interior, improved performance and improved fuel economy across the line. A new 250 hp 2.0-liter turbocharged direct-injection Boxer engine leads the list of new features for the crossover and it will also be powered by a 170-horsepower 2.5-liter naturally aspirated Boxer engine with improved fuel mileage. The new Forester crossover will feature their new Starlink in-car connectivity system and new driver assist system called EyeSight. The 2014 Subaru Forester will be launching here in the U.S. this spring. 2013 marks Subaru’s 55th anniversary and they will be celebrating by displaying the Subaru brand's history and future vision through the exhibition of the "Subaru 360" launched in 1958, the latest concept car "Subaru VIZIV Concept", 2013 Outback diesel with Lineartronic and the all-new 2014 Forester. Subaru is a brand to watch in Geneva this year.